With an Amlogic 905 Quad-core CPU, 1GB RAM and 8GB Flash storage, your movies will play smoothly and load faster. Stunning clarity vivid colour and sharp detail will make the best of new generation UHD TVs. Full HD 1080p also looks great. All sound formats from 2 channel stereo to 7.1 Dolby Digital passthough. Also Flac lossless HD audio is supported. With 10/100 ethernet, connect a standard cat 5 cable to a RJ45 network port (like on your router/modem) to get a fast and secure connection. Android opens a world of limitless possibilities through the Google Play store. Games, video players, APPs utilities and lots more. Connect USB flash drives, hard drives or input devices like mice, keyboards or webcams or read content from a Micro SD card. Miracasting is essentially HDMI over the Wi-Fi. 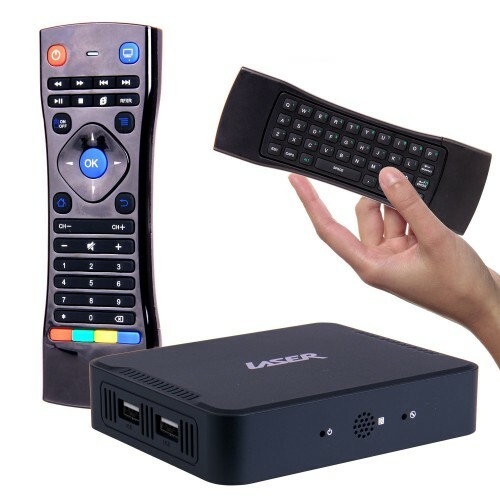 It allows you to connect to your TV and display the content that you have on your smartphone or tablet device. Simple and easy to use, Miracasting allows users to display images, movies, streaming content, web browsers and anything that you can see on your portable device onto your TV. It works across devices, regardless of brand. Miracast devices negotiate settings for each connection, which simplifies the process for the users. In particular, it obviates having to worry about format or codec details. Hardware decoding up to 4K which can support the real 4K output. 4K streaming content is compressed in order to be sent across the internet to your TV. Hardware powerful enough to decompress this content is needed to display 4K content on your television. High definition content is streamed using the H.264 Codec. This requires a lower specification media player to process. Our media player will process both these and many more codecs. Supports USB external memory devices such as hard drives or flash drives up to 2TB. Connect an external hard drive or flash drive to one of the USB ports situated on the side of the media player. Play back movies, videos, photos and music directly. Certain older USB hard drives requiring power from the USB port may not be supported (if you have a USB HDD with two USB plugs, then this is ok). DTS is a series of multi-channel audio technologies owned by DTS, Inc. The highest quality surround sound audio compliments the high definition picture creating a submersive audio environment. DTS creates a lifelike cinema experience in your home. It is the gold standard in audio quality. Wirelessly connect with your Bluetooth enabled keyboard and mouse, or joystick for gaming. Optical Audio is pure digital sound that is delivered via light from your Media Player to your TV or sound system. It offers a much higher quality sound than the traditional analog sound that comes from RCA jacks in older AV and home entertainment equipment. The Amlogic S905 Cortex A9 will hardware decode your codec to ensure smooth playback every time. Software decoding isn’t the best option because it’s not terribly efficient. Building a hardware decoder into a chip allows for more efficient operation, which means better performance on chips with modest grunt and improved efficiency. The Laser MMC-P20 Smart Media Player uses the Amlogic S905 – Same as S805 but adding extra video decoding up to 4K. This makes it more future proof than S805, and it could potentially be used as a media centre with a USB hard drive and Gigabit Ethernet connection. The S812, S905 and S912 are the only Amlogic Media Player chip capable of streaming 4K media content. Transform your TV or monitor into a smart Android device with the LASER 4K Smart Media Player. Quad-core CPU with 8Gb of storage and support for 4K @ 60FPS ensures clean video playback. Android OS allows for unlimited expansion and USB, HDMI, network LAN, DLNA, Wi-Fi and Bluetooth gives you limitless connectivity options. Turn any TV into a smart device with this multi-purpose entertainment solution that brings APPs, movies, music and more together in one.